© BRUCE DALE/NATIONAL GEOGRAPHIC Tasting abilities are often linked to an animal’s diet. A mutated sweet taste receptor, for example, has left cats, both wild and domestic, without a sweet tooth, likely as a result of their carnivorous diet. 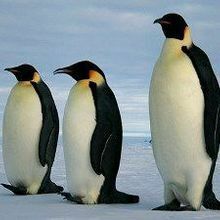 And bottlenose dolphins, which typically swallow their fish prey whole, have a reduced ability to taste bitterness. 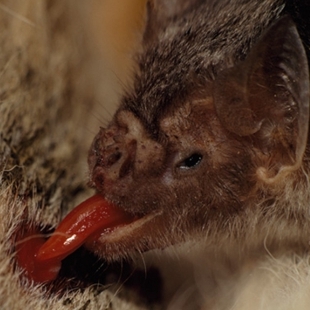 Now, researchers have found that vampire bats have similarly dampened bitter-tasting ability. 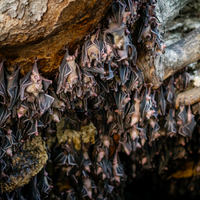 Reporting today (June 25) in Proceedings of the Royal Society B, the researchers postulate that, by dining exclusively on blood, vampire bats are unlikely to encounter the toxic plants and animals that likely selected other mammals to be able to detect bitter flavors. Huabin Zhao from China’s Wuhan University and his colleagues discovered the bats’ weakened bitter taste when they found a much greater number of the vampire bat bitter taste receptor genes were pseudogenes, as compared with the receptor genes of 11 other bat species. “Unlike other mammals, vampire bats lost bitter taste very recently, suggesting they may switch their diet from insects to blood in a recent time range,” Zhao told BBC News. “More importantly, bats represent a unique case in mammals for studying the driving force in taste receptor evolution.” Previous work from Zhao’s group has suggested that vampire bats are also largely unable to detect sweet and umami, or savory, flavors. 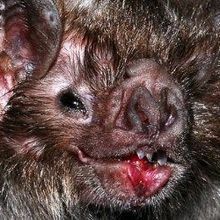 Vampire bats do appear to have retained some functioning bitter taste receptors, which may play a role unrelated to the selection of food. “From our study we understand that vampire bats do not need bitter taste, but some bitter taste receptor genes are still needed in vampire bats for other functions,” said Zhao, who told the BBC he now plans to explore the role of these functioning receptors.